Fresh local seafood turns everyday meals into a celebration. Our fresh seafood store makes it easy to prepare traditional Cajun and Creole dishes or create something entirely new to impress friends and family. We also sell fresh sushi if you need a quick seafood fix that’s ready to eat. We know how important quality is when you’re feeding your family or making a romantic dinner for two, which is why we source a variety of delicious fresh fish options for you to cook at home. Fry up a batch of fresh catfish, sear some redfish on the grill or bake flounder to fork-tender perfection with seafood from Acquistapace’s Covington Supermarket. Pay a visit to our wine department to get advice on what to pair with your fish, and then craft a gourmet meal to remember. Whether you’re making crawfish etouffee as a Friday night dinner, barbecue shrimp as a potluck main dish or a pot of seafood gumbo for a special occasion, count on our fresh shrimp and Louisiana-sourced crawfish tails to add an authentic local touch. Frozen fish and shellfish options let you enjoy your favorite seafood year-round, and in-season varieties deliver top-quality seafood options at the peak of freshness. We also carry all the seasonings you need to prepare delicious dishes such as lemon-pepper scallops or blackened redfish, our seafood experts can make suggestions and offer cooking tips if you’re interested in trying something new. When spring weather hits, crawfish season begins. Instead of boiling it yourself, stop in to our seafood department to get fresh boiled crawfish that’s ready to eat. Grab a couple of pounds as a quick snack or buy a big bag for a gathering in your backyard. 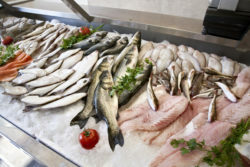 Our fresh seafood store makes it easy to find the ingredients you need for everything from fish fries to healthy meals. Stop in at Acquistapace’s Covington Supermarket, conveniently located at 125 East 21st Avenue in Covington, and pick up some fresh fish, shrimp and seafood today.